If a member's record currently has pending changes, you cannot edit the record until after the organization administrator reviews and accepts those changes. In the Search field, type the name of the member whose information you want to view. Then, click the search icon (magnifying glass). To edit the record, click Edit Details. 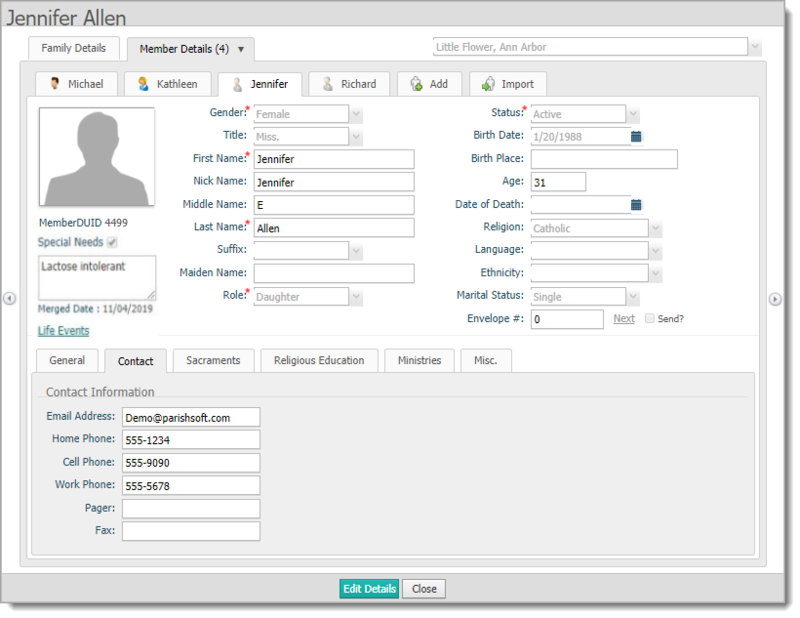 The form opens in edit mode, enabling you to make changes to the fields. Click Save to save changes to the form in the database. The tab remains in edit mode to enable you to continue making changes. Click Save & Close to save the changes to the form. You exit the tab and return to the Member List. Click Close to exit the tab and return to the Member List. You are prompted to save or cancel changes. Click Cancel to cancel to exit the tab without saving changes. Click Delete to delete the selected family member's record.